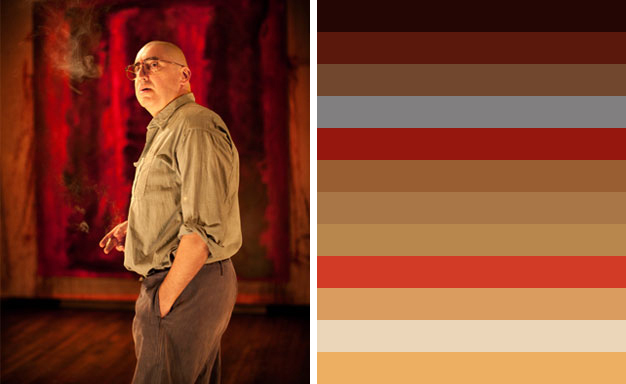 The horizontal field of colours (above) are the twelve most common colours that appear in the web based photographic image of Alfred Molina as Mark Rothko. These colours have been automatically sampled by the open source program Colorsuckr. Also see Arthur Buxton's Van Gogh Visulisation and Michael Demers Color Field Paintings (Browser). 'Just Press P' has been created as an online space that engages with post digital practice in the graphic arts. In this instance the relationship with graphic arts practice relates to the discipline of printmaking and the realization of physical artefacts in the digital age. Here the post digital emphasis does not negate the use of digital technology but seeks to consider its influence upon making and contemporary craft orientated pursuits. By embracing both physical rendering and digital thinking the blogs focus maybe best described as the period of analogue after digital. Follow Paul's board Analogue after Digital on Pinterest. This is a Flickr badge showing public items from Laidler tagged with blogged. Make your own badge here.